1. Drybar Texas Tea Volumizing Shampoo and Happy Hour Weightless Conditioner - I don't tend to test out too many hair products because I like to stick with what works for me, but I have heard so many great things about the Drybar line that I was intrigued. The volumizing shampoo is lightweight and gives my hair a good 'oomph' at the roots - but the main selling point was the fact that it didn't tangle my hair in the shower. Many shampoos work great but because my hair is naturally curl, they will cause it to become a tangled mess while washing it. The weightless conditioner made my hair feel smooth and silky, but I made the mistake of using too much at first and my hair was a greasy mess. The key is to use just a small amount on the ends of the hair to get the best results. 2. Charlotte Tilbury Skin Perfecting Micro-Powder - I am already in love with a ton of Charlotte Tilbury products (this palette in sophisticate, this concealer, this mascara), so I had a feeling this powder would perform as well. And it did. It is so finely milled that it feels like nothing to the touch, but gently creates an airbrushed finish to the skin without making it look flat or dull. It manages to give a velvety yet radiant finish to the skin (sounds like an oxymoron but it really does! ), while keeping shine away for most of the day. 3. 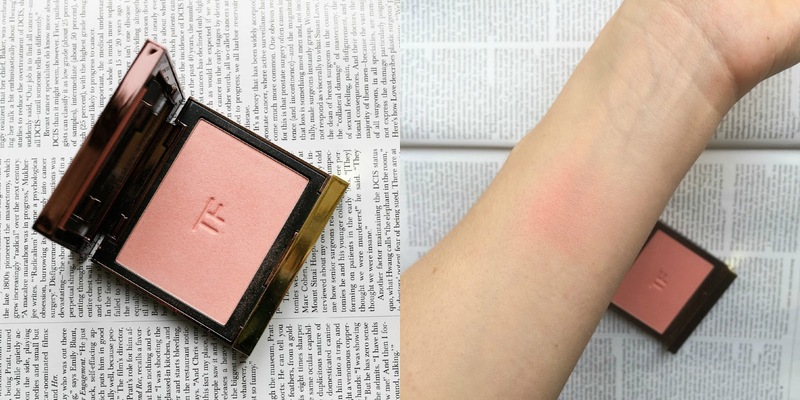 Tom Ford Blush in Frantic Pink - So much attention is always placed on the new color collections that classic staples from each makeup line go unnoticed. I recently had a gift card to spend and instead of splurging on a new item, I decided to go for a product that has been on my radar for a while. This is my first Tom Ford blush and it certainly won't be my last. Unfortunately the lighting really washed out the color because it is definitely more vibrant than it shows below. It is the most perfect punchy pink on the cheeks. Completely summer approved but still a blush that can carry you into fall and winter. And it manages to straddle the pink/peach divide quite well so it will work with just about any eye shadow look - gray, brown, green or plum. 4. Clarins Super Restorative Total Eye Concentrate - Initially what drew me to this eye cream was that it can be used for the entire eye area, even the lid. The texture is a rich cream which can be hit or miss with me. Sometimes rich textures can cause milia under my eyes, but thankfully that was not the case with this one. It instantly nourished and hydrated the area making me look more awake and refreshed. I particularly like to use this in the morning because I find that it helps to smooth the under eye area quickly and even has a slight depuffing effect for me. And after a sleepless night (I struggle with those often, ugh), it helps to pull my under eye area together quickly so I can get out the door. What is the last beauty product you purchased? Any favorites that you have been loving lately? Just got the First Aid Beauty Vitamin Hydrating Mist and it has been giving me life in the morning! oooh I love that one! Oooh lovely! Two of these have been have been on my radar for ages. Tom ford frantic pink you will be mine! Can I ask which colour you picked up in the CT powder? I've been wanting to try this for ages but as Australia has no actual counters it's hard to commit to a base shade. I got the lightest shade and it's perfect for me!